The beginning of a new year marks a symbolic turning point for many – it is a time to reflect on the past and plan for the future. 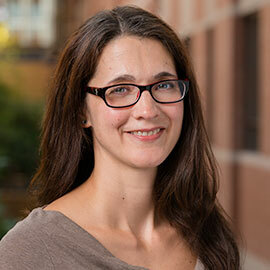 Laurier Psychology Professor Anne Wilson, an expert on goal pursuit, change and self-identity, studies how using landmarks, like New Year’s Day, can act as a motivating transition point to make change. But setting goals, especially New Year’s resolutions, are notoriously difficult to maintain and achieve. Wilson says that when people think about their future self, they conceive of a future self that is better than they are now. Though people have positive feelings about the future, the challenge to realizing any goal is the approach to the process. Strategies such as virtual aging programs facilitate interaction between a person and an aged version of themself – they can literally meet their future self. Wilson also suggests practicing visualizations of the “future self” or writing a letter to the “future self” to help mitigate any hesitation to sacrifice now for the future. “The key is to make the future seem close at hand. Our perception of time can be very elastic, so we can use that to our advantage when goal setting to ‘trick’ ourselves to be more committed to our goals,” said Wilson. Resolutions tend to be focused on sweeping self-improvements such as losing weight, enjoying life and saving more money – lofty goals even for the most disciplined of achievers. Wilson recommends making very specific goals with immediate steps that can be taken to achieve the longer-term goal. It can also be useful to focus on the short-term positive experiences of fulfilling a long-term goal. Wilson says a common pitfall of New Year’s resolutions is the long lead-up time that tends to derail a goal before it has even begun. Having goals that are externally driven is another common mistake people tend to make. One of the most important things to remember with goal setting, though, is self-compassion. “Often failure is met with guilt, shame and blame, which aren’t very helpful in persevering when ultimately any long-term goal will meet obstacles,” said Wilson. Practicing self-compassion encourages people to treat and speak to themselves like they would a friend who is experiencing a setback. Wilson is a Canada Research Chair in Social Psychology, a Fellow of the Canadian Institute for Advanced Research Successful Societies program, and a member of the College of New Scholars, Artists, and Scientists at the Royal Society of Canada.